Cooling towers at the Scholven coal-fired power plant in Gelsenkirchen, western Germany. A leaden cloak of responsibility lies on the shoulders of UN scientists as they put the final touches to the first volume of a massive report that will give the world the most detailed picture yet of climate change. A leaden cloak of responsibility lies on the shoulders of UN scientists as they put the final touches to the first volume of a massive report that will give the world the most detailed picture yet of climate change. Due to be unveiled in Stockholm on September 27, the document will be scrutinised word by word by green groups, fossil-fuel lobbies and governments to see if it will yank climate change out of prolonged political limbo. 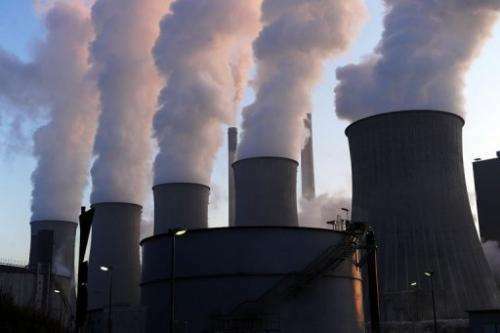 The report will kick off the fifth assessment by the Intergovernmental Panel on Climate Change (IPCC), an expert body set up in 1988 to provide neutral advice on global warming and its impacts. Six years ago, the IPCC's fourth assessment report unleashed a megawatt jolt of awareness. 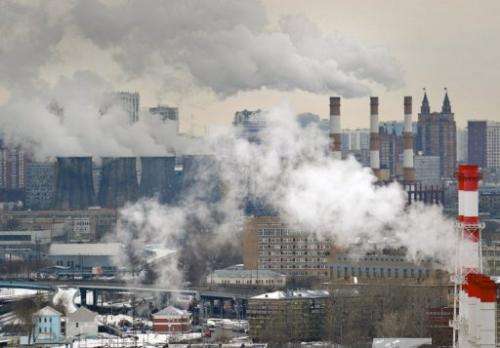 It declared that the planet was warming, that this was already starting to affect Earth's climate system and biosphere, and that there was overwhelming evidence that humans, especially by burning coal, gas and oil, were the cause. 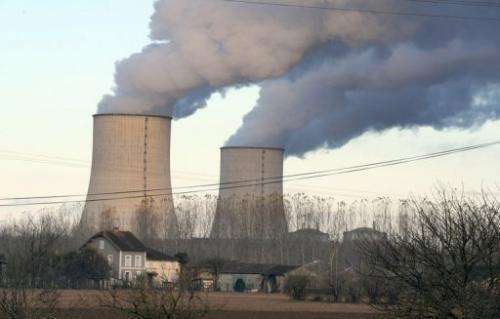 It earned the IPCC a share in the Nobel Peace Prize with former US vice president Al Gore and stoked momentum that led to the 2009 climate conference in Copenhagen, the biggest summit in UN history. Yet that was the high point. The near-fiasco of Copenhagen combined with a financial crisis that struck Western economies... and climate change vanished off politicians' radars. Then came damage to the IPCC's own reputation, when several errors were found in the landmark report, prompting a fightback by gleeful climate sceptics and a painful investigation of the panel itself. A draft of the leviathan new work, seen by AFP, will amplify the 2007 warning in several ways. The panel will declare it is even more confident that global warming is man-made and starting to affect extreme weather events, such as flooding, drought, heatwaves and wildfires. It also warns of a potential rise in sea levels that, by century's end, would drown many coastal cities in their current state of preparedness. Cooling towers at the Golfech nuclear power plant, southwestern France. 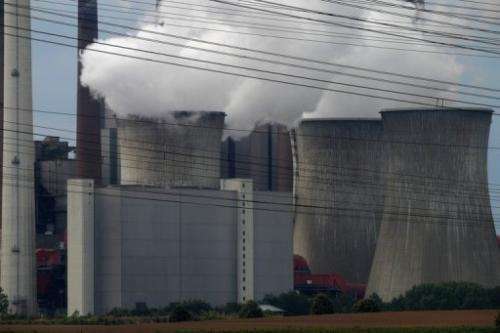 A new report on climate change will kick off the fifth assessment by the Intergovernmental Panel on Climate Change (IPCC), an expert body set up in 1988 to provide neutral advice on global warming and its impacts. "Changes are projected to occur in all regions of the globe, and include changes in land and ocean, in the water cycle, in the cryosphere, in sea level, in some extreme events and in ocean acidification. Many of these changes would persist for centuries. Limiting climate change would require substantial and sustained reductions of CO2 [carbon dioxide] emissions," warns the draft. The document, focussing on the science of climate change, will be followed next year by two volumes, on impacts and on how to tackle the problem, followed by a synthesis of all three texts. The main text is written and approved by scientists, and cannot be modified by national governments, who also have representatives on the IPCC. The governments do have a say, though, in the all-important summary for policymakers, which in its present form runs to 31 pages. So far, they have raised 1,800 reservations about the summary, and these will be hammered out in a line-by-line appraisal over four days before next month's release. Defenders of the laborious system say approval by governments amounts to a "buy-in" from all the world's nations—a consensus ranging from huge carbon polluters China and the United States and vulnerable small-island states such as the Maldives to major oil and gas exporters like Qatar and Saudi Arabia. "I am greatly in favour of this process of comments followed by adoption," Jean Jouzel, a leading French climate scientist who is vice president of the IPCC group in charge of the upcoming volume, told AFP. "The adoption is what gives the IPCC report its success and visibility, and enables its effective use by governments." Others are not so sure. Inclusiveness, transparency and nitpicking mean the process is horribly slow. An aerial view on Moscow. Many coastal cities may be flooded by risking sea levels, said a draft of the latest climate change report. Almost every week, new evidence of climate damage is published in peer-reviewed scientific journals. But the most recent scary stuff—the discovery, for instance, that melting permafrost is starting to leak methane, a potent greenhouse gas—will not be included in the new report because of the cutoff date for reviewing material. "It [the summary] is a powerful document because it is signed off by all governments," said a source who follows the process closely. "But the IPCC has become such a conservative organisation. The report is really science at the lowest common denominator." Michael Mann, a professor at Penn State University and author of a book, "The Hockey Stick and the Climate Wars," blames this in part on campaigning by well-funded sceptics who either deny global warming or pin it on natural causes, such as fluctuations in solar heat. They intimidate individual scientists and exploit areas of scientific uncertainty to claim there is no expert consensus, he said. As a result, the IPCC compilers are driven to even greater caution, with the risk that they deliver a message that is fuzzy or larded with doubt. "I believe that these pressures combine with the innate tendency of scientists to be reticent about drawing strong conclusions," said Mann. As a result, "assessment reports like the IPCC report almost inevitably end up understating the conclusions and, in this case, the risks of human-caused climate change." What we need to do to save the planet from a CO2 disaster is to shut down the denial machine by insisting that science stops saying "maybe" and starts saying "will be" a crisis as what denier would deny an "inevitable crisis" instead of saying "possible crisis" for 28 years? Science has never agreed or said anything beyond "could be" a crisis. Unless CO2 mitigation starts soon we are doomed but denialism is preventing our children from having futures. They're not entitled to do so as scientists. They're entitled to lay out the facts that the anthropocentric burning of co2 will likely have an effect upon global climate,.... but they're not entitled to speculate as to "disaster" or "crisis" for mankind, as that is pure unfounded speculation. "Denialism" has nothing to do with it. There are enough AGW believers now to make a difference, if only THEY stopped driving co2 based cars, and reduced THEIR standard of living by reducing their energy use, or went to greater personal expense to do so. In fact the AGW advocates for the most part are behaving exactly same way as the AGW deniers in use of energy, as it is human nature to pursue ones self-interest, not to put oneself voluntarily at disadvantage. It is also human nature to fight against forces that desire to oppress these natural instincts. The issue is several orders of magnitude more complex than the simple naiveté of "lets fix the planet or it will be cataclysmic for humanity". There must be something of immediate tangibility to respond to. Not just speculative theory of cataclysm. The collective genius of mankind doesn't buy that it is a crisis. is to shut down the denial machine by insisting that science stops saying "maybe" and starts saying "will be"
That would be a mistake - as it would turn science into non-science. But they are entitled to do so as concerned citizens. Having a (in this case extremely well ) founded opinion entitles one to be heard. Sensible extrapolation of facts based on well working models is not just 'speculation'. And if someone has a good forecast then at some measure of certainty it is permissible to say that a storm is coming. Most liberals and far leftists who think likewise, also support abortion which resoundingly prevents children from having a future. This is further evidence that "AGW denialism" is nothing more than a straw-man, and that even far left AGW advocates will act egoistically for their own self-interest at the expense of others. But that's not what he said and what I was responding to. He advocated scientists degenerate into propaganda. What forecast has there been, to quantifiably justify such subjective language? The "ThisGuyIsAMoron" [open, toot, lite etc] troll rated both myself and mememine69 a one, despite the fact that we have opposite views. More proof that it doesn't read posts, and is likely someones half-wit nephew. "As we approach the end of August, there have been no Atlantic hurricanes. By this date in the year 1886, there had already been seven hurricanes – including three major hurricanes, one of which wiped the city of Indianola, Texas off the map." MIAMI (Reuters) - The 2013 Atlantic hurricane season is still on track to be "above normal" but "extreme levels of activity" are less likely, the top U.S. government climate agency said on Thursday." Obama, the drone warrior, won the Nobel Peace Prize for doing nothing. Draw your own conclusions. As a former Obama supporter, I have to agree that that was a pretty stupid move by the Nobel committee. But you have to put it in context. At the time, everybody thought Obama was actually serious about his campaign promises - back then he was antiwar, antisecrecy, against Guantanamo, against the insane terrorism rhetoric. After the rampant abuses under Bush, Obama looked really, really good. So they gave him the Nobel Prize with the intention of basically trying to nudge him along in the right direction. Of course, Obama has since turned out to be Bush 2.0, only smarter and more efficient at implementing his extremely bad policies. If I could go back, I would never have voted for Obama. Unfortunately, I don't know who I would have voted for instead. McCain wouldn't have been any better. Neither would Hillary. It sort of drives home the fact that there aren't any good choices. Why not use this experience voting for Obama as a lesson,... i.e. perhaps once confronted with hard realities, left wing campaign naiveté becomes useless. Obama started out no different than those who voted for him, idealistic and liberal,... he is still no different from you, only confronted with reality, instead of cowering in idealistic fantasy. Bush and McCain have more leadership experience and skill in their little finger than BHO. Bush or McCain aren't as conservative as many would have liked, but it's not likely there would have been a 5 year recession under Bush or McCain. I suspect Libya, Egypt,Syria, Afghanistan, and all other foreign policies would have been much different and neither would have conducted a world apology tour and neither would have played as much golf. And I would have no doubt McCain or Romney would not put the national security of the US subservient to any other state. Please stop forever pasting this in - yes, yes we do know. According the the AGW Prophet (who is making a lot of Profit on this scam), when he first declared the AGW scam in the 1990's, what is the temperature suppose to be now, how high should the sea levels be, etc? Can someone who believes in the Profit Al Gore answer the question, is Al Gore a hypocrite or a liar? Being glad that Obama has won I nevertheless thought the Nobel Peace Prize was a mistake. Just giving out a prize based on a promise isn't a good idea (if you look at the Peace Prize recipints you'll notice such illustrious figures as Arafat got on, too, for maknig a couple of promises). The Peace Prize should be awarded for deeds done - not for future 'maybes'. If I could go back, I would never have voted for Obama. I dunno. Do you remember the alternative? We'd be knee deep in WWIII by now with someone of McCaine's anger management issues - or the US completely at the mercy of predator capitalists with Romney (at least more so than it is already). Obama was (and is) the lesser evil. BHO attacked Libya and now is supporting Al Queda in Syria. I don't think McCain would have supported an enemy of the US like BHO has and is doing. BTW, how do you Euros and other like have the US sit on the diplomatic sidelines for a few years, which is what BHO has done? Only the evil, only the tyrants and want to be tyrants consider those who want freedom, justice, and liberty for all to be terrorists. Lets see, Obama doesn't like the first, second and forth amendment. He support terrorist groups, sells guns to drug cartels, goes after reporters, lies about a terrorist attack then blames the attacks on an unknown film maker who then goes to jail, uses the IRS to attack enemies, uses the DOJ to silence people. OK, those on Physorg that are paid by the Government to defend Obama..... you say what???? You are a conspiracy mongering idiot and so is anyone who positively rated your comments (Noumenon). Apparently, for you, name calling is easier than providing a reasoned counter argument.